Hello friends. I've been on a kale kick lately, and I have been using this vegetable in many of the different dishes I make. 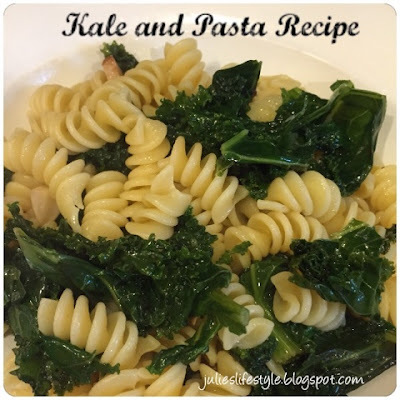 Today I'm sharing with you this easy to make kale and pasta recipe. I enjoy cooking pasta when I run out of ideas for what to make for dinner. I usually have the pasta and kale on hand, and you can find me making this dish about once a week. In the first photo below you can see the kale sauteing in the pot. In the second photo you can see the kale and pasta all mixed together and done cooking. This is a quick and easy recipe to make using kale. 1. In a pot add olive oil, garlic, and red pepper flakes. Salute until garlic is golden brown. Add the kale, water, and mix everything together. Cook until kale has wilted down.2. Meanwhile cook the pasta as the directions call for on the back of the box. When pasta is finished cooking, drain the pasta into a colander. 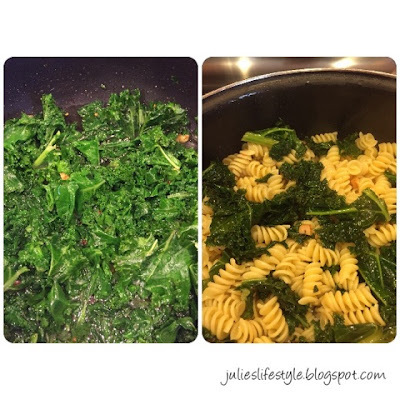 Add pasta to the pot of cooked kale. Mix everything together.3. Add pasta and grated cheese to each dish. To see more of my recipes you can click HERE. This is right up my alley! Simple and healthy! I don't cook with kale so I need to try this! It's been a while since I picked up some kale. This looks like a delicious way to use it! I need to put kale back on the grocery list. I have to admit, I haven't been a huge fan of kale. But this looks really good - I'll have to try it! Looks and sounds super healthy and easy to make Julie! Thanks for sharing :). (enjoy the weekend. Looks like we dodged Matthew). Looks good, but unfortunately I cannot eat Kale since I am on blood thinners. Hope all is fine with you and you are enjoying Fall. We are having 90 degree weather here. Sure wish it would cool off. I have to start buying some Kale! I haven't cooked with it much. I have been on an arugula kick lately :-) Thanks for the recipe! I need to try this Julie! I just picked a bunch of Kale in the garden today. Hubby isn't a big fan of it, but maybe in pasta he will like it. :) Thanks for sharing with SYC. Looks delicious, my friend. I have never thought to put kale in pasta...yum! Have a wonderful day. Hugs! Your Kale and Pasta looks delicious and thanks so much for sharing it with us! Have a great week and come back to see us at Full Plate Thursday real soon!